Each regional marketing board focuses on product development—identifying unique experiences that exemplify the meaning of New Mexico True within that region. 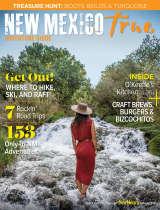 This means stronger collaboration with neighboring attractions and communities, crafting itineraries for travelers, working towards a regional identify that fits within the New Mexico True brand, and finding ways to cross-promote with other regions. Each regional marketing board consists of eight members from the public or private sector, each of whom are directly involved in their community’s marketing efforts. The Tourism Department relies heavily on these key positions, which are appointed by Cabinet Secretary Rebecca Latham. We are looking for passionate board members with a strong interest in product development, a keen knowledge of their region’s resources, and a commitment to rolling up their sleeves and entertaining new approaches. Board members are held to a standard of being the “brightest marketing minds in the state,” serve as a pipeline for information between the department and their region, and are willing to promote their region as a whole while learning about offerings from around the state. Meetings are held quarterly, and ongoing email communication and participation are also expected. Board meetings are open to the public and all tourism stakeholders are invited to participate. Contact the regional marketing board chair in your region for information on upcoming meetings and opportunities to get involved.